The book's title is The Golden Jet: A Spectacular Career in Stunning Photographs. You already know Bobby Hull had a spectacular career. Let me assure you the photographs in this books truly are stunning. This book is listed at $29.95 US/$34.95 CDN. (Apparently no one has told Triumph Books that the Canadian dollar is near par for a few years now.) For a book of this size loaded with so many rare and exclusive photos, that is a really reasonable price. And of course, many bookstores and online sources are selling it 30% less than the jacket price. The name Bobby Hull is synonymous with greatness when it comes to hockey in Chicago and throughout the NHL. One of the most charismatic and electrifying athletes of his or any era, Hull thrilled fans with his unique combination of speed, skill, and grace. Along the way, he became known as the finest left wing in hockey history and is still widely regarded to be the best ever. Featuring hundreds of rare, full-color photos from his personal archive and accompanying text from legendary Chicago sports columnist and Blackhawks team historian Bob Verdi, The Golden Jet gives Hull's millions of fans a never-before-seen glimpse into the life of this hockey icon. Bringing the pictures to life is an exclusive commemorative DVD, which includes highlights, interviews, and behind-the-scenes clips from the Blackhawks' video library. A must-have keepsake for Blackhawks fans of all ages, The Golden Jet is a rare opportunity to celebrate the life of the greatest hockey player in Chicago's history. 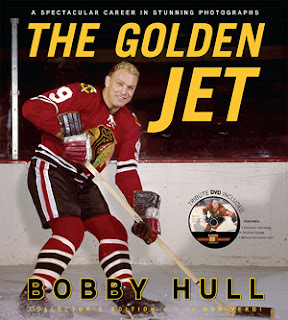 Bobby Hull is generally regarded as the greatest left wing in the history of hockey. During his illustrious 15-year Chicago Blackhawks career, he scored 604 goals-the most in team history-and led the 1960-61 squad to the Stanley Cup. He was inducted into the Hockey Hall of Fame in 1983. Bob Verdi is the Chicago Blackhawks' team historian and has covered sports for five decades, including more than 40 years as a columnist and contributor for the Chicago Tribune. He authored Chicago Blackhawks: Seventy-Five Years in 2001.